Richard Mullen has opted to ride Harcourt Street. Abu Dhabi Equestrian Club host racing for the third time this season on Sunday with a six-race card highlighted by the sole Thoroughbred contest, a handicap over 1400m, which has attracted the maximum allowed field of 14. Heading the weights in said affair is local debutant Fawaareq, one of two in the race to be saddled by champion trainer Doug Watson and one of three owned by His Highness Sheikh Hamdan bin Rashid Al Maktoum. Thrice a winner in Britain for Owen Burrows, Fawaareq has been gelded since his most recent racecourse appearance, in October 2017. With a handicap rating of 90, he could prove to be a Dubai World Cup Carnival contender with a top effort. A 5-year-old homebred gelding by Invincible Spirit, he is the first foal from his unraced dam, Ghandoorah, a close relation to Sheikh Hamdan’s 1000 Guineas heroine Ghanaati. The third dam, Height Of Fashion, is ancestress to a plethora of the owner’s very best performers, including the legendary Nashwan. Watson also saddles Dream Dubai for Mohd Khalifa Al Basti and the choice of Pat Dobbs. He has the advantage of an outing already this season, a pleasing third during the very first meeting of the campaign at Jebel Ali four weeks ago. That was his second start for Watson, having previously been second at Jinma Lake Racecourse in China. Retained by Sheikh Hamdan, Dane O’Neill has opted to partner Tafaakhor for Ali Rashid Al Rayhi. A dual winner for Richard Hannon before switching to the UAE, he has yet to win in eight local outings, all at Meydan and half of those on turf. He too has had a run this season—two weeks ago on the Meydan dirt—and is well drawn for his first outing in the capital. January, he is another owned by Al Basti but has been done few favours by the draw. Runner-up in the 2017 UAE Oaks (Gr3), Midnight Chica failed to beat a rival in two outings last season, but drops significantly in distance, having most recently run over 2400m at Meydan. A debut winner over a 900m dash on Keeneland dirt, she has not won since, but should not be ruled out. Chris Hayes rides for His Highness Sheikh Ahmed bin Rashid Al Maktoum and Nicholas Bachalard. Numerically, Satish Seemar has the strongest representation with three runners. Richard Mullen has opted for Harcourt Street with The New Maharaja the mount of champion jockey, Tadhg O’Shea. 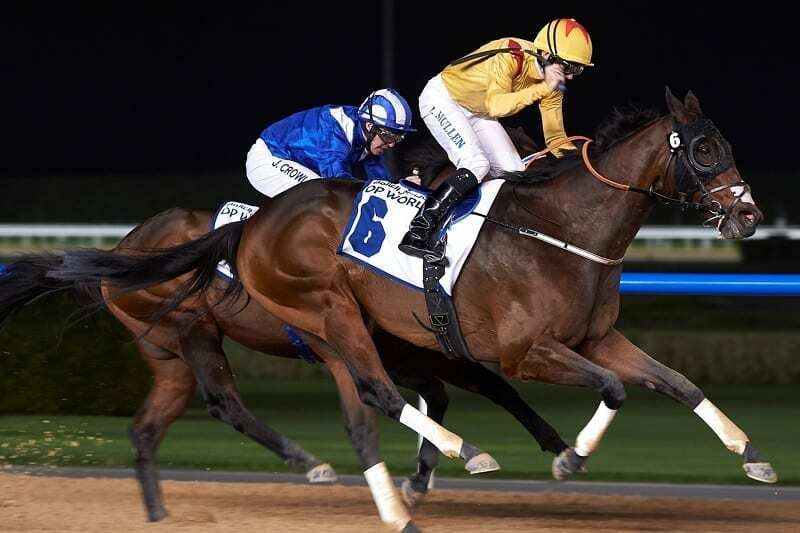 Under O’Shea, the 3-year-old son of Morning Line won his debut, over 1000m at Jebel Ali in January, returning to the same course just last Friday when fifth under Richard Mullen in a 1400m rated conditions stakes. The best of the Purebred Arabian action is the concluding 1600m handicap in which O’Shea partners AF Asheham for Khalid Khalifa Al Nabooda and Ernst Oertel. A winner twice from six starts, once over this course and distance, he is making his seasonal debut. For the Al Asayl team of His Highness Sheikh Khalifa bin Zayed Al Nahyan and Eric Lemartinel, Pat Cosgrave has elected to ride Bainoona, thrice a winner including over track and trip. Narjes and Mullen, riding for Helal Al Alawi and Yas Horse Racing Management, head the weights and look another to consider in a very tricky contest for Pick Six players.